Eve thought about this for a few minutes. 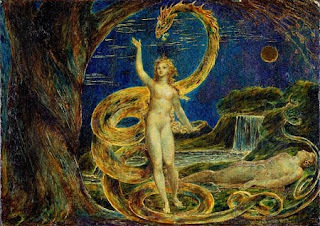 That “subtil” serpent was pretty convincing and Eve, deciding to take the risk that the fruit would bring her wisdom rather than death, took a large bite of the luscious fruit. Finding it quite delicious, she shared it with her partner, Adam. Eating the fruit opened their eyes in a new way: they suddenly realized they were naked. Not long afterward they heard God taking his usual early evening stroll in the Garden and they panicked, feeling that they must cover their nakedness. Of course when God saw them with their newly made figleaf aprons, he knew immediately what had happened and decided to punish them for their disobedience by banishing them from the Garden—in essence, sending them off to live on their own, without his help or the ease of life in the Garden. He told them it was going to be hard. So I guess we’re meant take this sentence at face value—God made coats of skin to clothe them. He gave them skin, which implies that up to this point they didn’t have any. What this really means is that he made them physical bodies. Genesis 3:21 is about Adam and Eve’s “descent” from the etheric state of being to the material one. Their new skin clothing was to serve as a “container” for their souls—their etheric essence and true being—and were appropriate for the material realm that they would now inhabit. Even though he was punishing them by casting them out of the Garden—the eternal world of spirit—and into the material world of limits, God was still worried that they might decide to try to eat the fruit of that other tree, the Tree of Life, and thus become immortal, godlike. In Genesis 2:22-24 he has a talk with himself (actually, himselves – but this is a topic we’ve already discussed) about this potential problem and comes to a decision as to what to do about it. He decides to post an angel and a rotating, flaming sword to discourage their re-entry. What this means, esoterically, is that they cannot simply shed their new physicality at will and return to the spirit realm, the Garden. If they want to return they will now have to work their way back on the terms of the physical realm. This means working hard,earth, tilling the earth, suffering pain, bearing their children in pain, and in general, enduring the limitations, hardships, and sorrows that go along with life on the material plane. These experiences cause the soul to learn and grow, to discern the difference between good and evil— a lesson that, over time, bears fruit in the form of wisdom. So in actuality, the serpent was right. Eating of the Tree of the Knowledge of Good and Evil does open one’s eyes, making one more godlike. But then again, God was right as well. Eating the fruit of that Tree does indeed cause one to die—to the relative freedom of the spirit world—as one is born into the physical world of time, limitation, and learning experiences.